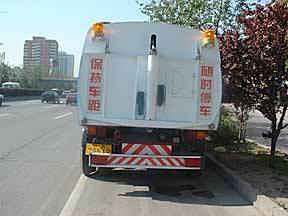 On the way out of Beijing, I spotted this sweeper at work. Although I stopped to take pictures, since no one was around who spoke English I don't know what kind it is. However, I posted a request online for someone who knew about the sweeper to let me know. As you'll see below, we got our answer sometime later. In September of 2004, we received the following from a man named Stephen, who works as a translator for Hyva China. Here's what Stephen told us about the sweeper in the photo. I have previously worked for the factory of the sweeper as shown in the attached page from your site. 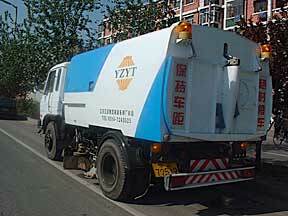 This sweeper is made in "Yang'zhou Sheng'da Special Vehicle Factory". It was a state-owned factory. Now, it's been bought by a group named "Greencool." For more information on the group, you could vist the website: www.greencool.net. English version pages are available on the site. 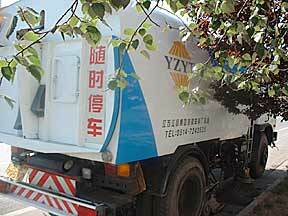 The sweeper is made based on a Dongfeng chassis, which is a local brand of chassis. Below are the main technical parameters for the sweeper.